As far as the surface parking goes, I'm pretty sure that is just using the existing space for now and it will eventually be replaced by mixed use buildings, most likely with underground parking in some of the buildings. Oooh, nice catch of the close up! I'm almost embarrassed at how giddy I am with these images. My first reaction to seeing the Wendy's remodel was rats, it's not being torn down. This means it's not going anywhere anytime soon. Looks like some remodeling work going on at the building just south of the Riverview Theater along 42nd Ave S. Not sure what might go in there, but it's been vacant forever. Perfect spot for a restaurant/food service. The wrap isn't as attractive as the drawings. I hope once it's fully covered it will look different, but so far it looks like the debris mesh covering you see on scaffolding during remodeling jobs. The triangle island in the middle of the intersection and the sidewalk along the building could use some heavy duty bollards. Not sure how common it is to see cars plow into the existing lot, but seems like the building would be a target for drunk or distracted drivers. Pretty sure those initial estimates were extremely rough and very early on in the process. Lowest number I ever saw was 150M. Here are some pictures I took today. Doesn't look like it's temporary. Anybody know where dirt that is piling up east of Hiawatha and south of Lake St. is coming from? 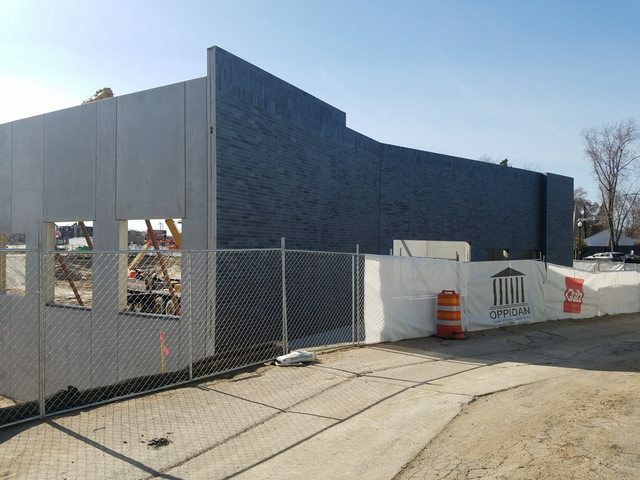 For those who have been by this project lately, is it strange that they have a corner wall built up along the alley behind Falls Liquor before they have the foundation for the building in place? I wasn't expecting to see any walls above ground for a while. The parking should fill in over time.